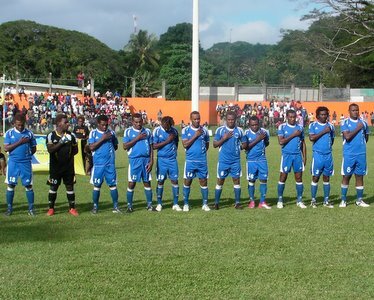 The first friendly match will be against Solomon Islands’ O-League representative club, Koloale. This match will be held at Koloale’s home ground AE Oval in Honiara. After playing Koloale the team will head to Auki in Malaita province to play a select side. It will be the first time for a national team to make a provincial tour in Solomon Islands and excitement is already building up in Auki ahead of the match on Monday. Members of the national team contingent will leave Honiara on Sunday and return on Tuesday. The invitation came from the Malaita provincial government and the Malaita Football Association (MFA), a provincial affiliate of the Solomon Islands Football Federation (SIFF). Their request was based on the intention of assisting the national team with their Pacific Games preparations and also to give their provincial team a test match as they look ahead to the Solomon Cup in November. Speaking from Auki, MFA president Derek Taka, says that bringing the national team over to Auki will be great for local football and everyone is eager to welcome the team. “Locals here are always eager to witness big matches and since Aligegeo has opened we have been able to bring some Honiara clubs but the visit of the national team will be the biggest one yet and we all look forward to it,” Taka says. Bonitos team manager, William Lai, says that the national side is honoured by this request from Malaita province and the team will make use of the opportunity. The match will take place at the FIFA Goal III Project funded Aligegeo stadium in Auki which is currently hosting the Malaita Cup, the province’s premier football tournament. The select side the Bonitos will be playing will compose of the top players selected from the Malaita Cup. The competition is expected to wrap up with the grand final on Saturday.